CAIRO — Egypt’s top military officer warned Tuesday of the potential “collapse of the state” if political forces in the country did not reconcile, reflecting growing impatience with the country’s growing unrest. Egyptian protesters celebrated the capture and destruction of a state security armored vehicle on Tuesday in Tahrir Square in Cairo. His remarks came as violence in Cairo began to escalate. During clashes between riot police and protesters along the Nile Corniche early on Tuesday, the fighting spilled into one of the city’s luxury hotels, leaving the lobby in ruins. The worst of the turmoil, which has left at least 45 people dead, has been in Port Said at the northern tip of the Suez Canal. Egypt’s president, Mohamed Morsi, has imposed a monthlong state of emergency in the city and two others in the Suez Canal zone, calling on the army to regain control of security. General Sisi also said the army would protect the “vital” Suez Canal. The state of emergency imposed by Mr. Morsi virtually eliminates due process protections against abuse by the police. Angry crowds burned tires and hurled rocks at the police. And the police, with little training and less credibility, hunkered down behind barrages of tear gas, birdshot and occasional bullets. The sense that the state was unraveling may have been strongest in Port Said, where demonstrators have proclaimed their city an independent nation. But in recent days, the unrest has risen in towns across the country. 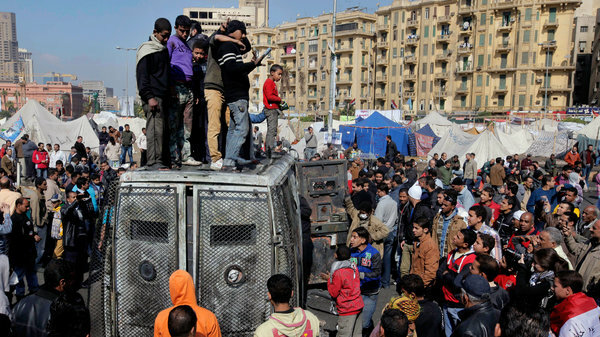 In the capital on Monday, a mob of protesters managed to steal an armored police vehicle, drive it to Tahrir Square and make it a bonfire. After two years of torturous transition, Egyptians have watched with growing anxiety as the erosion of the public trust in the government and a persistent security vacuum have fostered a new temptation to resort to violence to resolve disputes, said Michael Hanna, a researcher at the Century Foundation, based in New York, who is now in Cairo. “There is a clear political crisis that has eroded the moral authority of the state,” he said. And the spectacular evaporation of the government’s authority here in Port Said has put that crisis on vivid display, most conspicuously in the rejection of Mr. Morsi’s declarations of the curfew and state of emergency. As in Suez and Ismailia, tens of thousands of residents of Port Said poured into the streets on Sunday in defiance just as a 9 p.m. curfew was set to begin. Bursts of gunfire echoed through the city for the next hours, and from 9 to 11 p.m. hospital officials raised the death count to seven from two. When two armored personnel carriers approached a funeral Monday morning for some of the slain protesters, a stone-throwing mob of thousands quickly chased them away. And within a few hours, the demonstrators had resumed their siege of a nearby police station, burning tires to create a smoke screen to hide behind amid tear gas and gunfire. Many in the city said they saw no alternative but to continue to stay in the streets. They complained that the hated security police remained unchanged and unaccountable even after President Hosni Mubarak was ousted two years ago. Protesters saw no recourse in the justice system, which is also unchanged; they dismissed the courts as politicized, especially after the acquittals of all those accused of killing protesters during the revolution. Then came the death sentences handed down Saturday to 21 Port Said soccer fans for their role in a deadly brawl. The death sentences set off the current unrest in this city. Nor, the people said, did they trust the political process that brought to power Mr. Morsi and his Islamist allies in the Muslim Brotherhood. He had vowed to usher in the rule of law as “a president for all Egyptians.” But in November, he used a presidential decree to temporarily stifle potential legal objections so that his Islamist allies could rush out a new Constitution. His authoritarian move kicked off a sharp uptick in street violence leading to this weekend’s Port Said clashes. “Injustice beyond imagination,” one man outside the morning funeral said of Mr. Morsi’s emergency decree, before he was drowned out by a crowd of others echoing the sentiment. 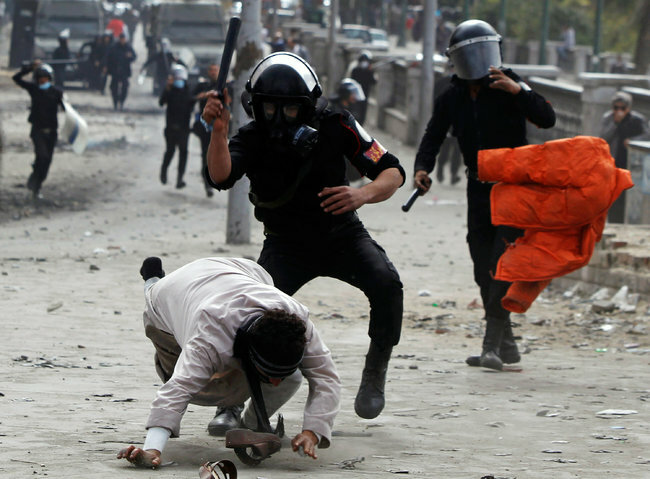 Riot police beat a protester during clashes in Cairo on Monday. “He declared a curfew, and we declare civil disobedience,” another man said. Officials of the Muslim Brotherhood and its party could not be reached. The group had recently moved offices because of security threats, and at the new office, neighbors said Brotherhood officials had not appeared since the start of the unrest. As tens of thousands marched to the cemetery, many echoed the arguments of human rights advocates that the one-month imposition of the emergency law and reliance on the military would only aggravate the problem. The emergency law rolled back legal procedures meant to protect individuals from excessive violence by the police, while the reliance on soldiers to keep the peace further reduced individual rights by sending any civilians arrested to military trials. The police remained besieged in their burned-out stations, glimpsed only occasionally crouching with their automatic rifles behind the low roof ledges. When one showed his head over a police building as the funeral march passed, voices in the crowd shouted that his appearance was a “provocation” and people began hurling rocks. Others riding a pickup in the procession had stockpiled homemade bombs for later use. In a departure from most previous clashes around the Egyptian revolution, in Port Said the police also faced armed assailants. Two were seen with handguns on Monday around a siege of a police station, in addition to the man with the Kalashnikov. Earlier, a man accosted an Egyptian journalist working for The New York Times. “If I see you taking pictures of protesters with weapons, I will kill you,” he warned. Defending their stations, the police fought back, and in Cairo they battled their own commander, the interior minister. Brotherhood leaders say Mr. Morsi has been afraid to name an outsider as minister for fear of a police revolt, putting off any meaningful reform of the Mubarak security services. But when Mr. Morsi recently tapped a veteran ministry official, Mohamed Ibrahim, for the job, many in the security services complained that even the appointment of one insider to replace another was undue interference. In a measure of the low level of the new government’s top-down control over the security forces, officers even cursed and chased away their new interior minister when he tried to attend a funeral on Friday for two members of the security forces killed in the recent clashes. “What do you mean we won’t be armed? We would be disarmed to die,” one shouted, on a video recording of the event. In an effort to placate the rank and file, Mr. Ibrahim issued a statement to police personnel sympathizing with the pressure the protests put on them. Later, he promised them sophisticated weapons. “That can only be a recipe for future bloodshed,” said Hossam Bahgat, executive director of the Egyptian Initiative for Personal Rights, which monitors police abuses. 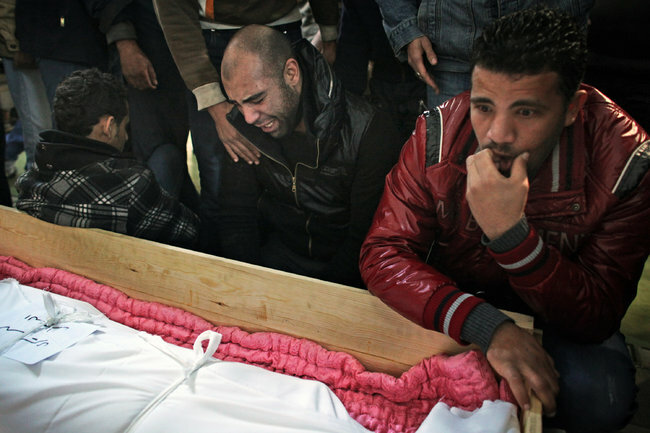 Egyptians on Monday mourned the death of Mohammed Yousra, 27, one of seven people killed in clashes with the police in Port Said. By turning to the military, Mr. Morsi signaled that he understood he could not rely on the police to pacify the streets, Mr. Bahgat argued. But it was far from clear that Mr. Morsi was fully in command of the military either. The new Islamist-backed Constitution grants the general broad autonomy within the Egyptian government in an apparent quid pro quo for turning over full power to Mr. Morsi in August. Mr. Morsi’s formal request for the military to restore order was “not so much an instruction as a plea for support,” Mr. Bahgat said. It remains to be seen whether the military retains the credibility to quell the protests. The soldiers stationed in Port Said did nothing to intervene as clashes raged on in the streets hours after curfew Monday night. Analysts close to the military say its officers are extremely reluctant to engage in the kind of harsh crackdown that would damage its reputation with Egyptians, preferring to rely on its presence alone. Near the front lines of the clashes, residents debated whether they would welcome a military takeover. “The military that was sent to Port Said is the Muslim Brotherhood’s military,” said one man, dismissing its independence from Mr. Morsi. LE CAIRE – L’armée égyptienne a mis en garde mardi matin contre les risques d’effondrement de l’État alors que des manifestants ont défié le couvre-feu imposé par le président Mohamed Morsi dans trois villes situées le long du canal de Suez. Aucun incident n’était signalé à Port-Saïd, Ismaïlia et Suez et un calme précaire régnait autour de la place Tahrir, au Caire, au sortir d’une nuit marquée par de nouveaux affrontements. Le chef d’état-major de l’armée égyptienne a prévenu mardi matin que « la poursuite du conflit entre les forces politiques sur la marche des affaires de l’État risquait de conduire à l’effondrement de l’État ». Les défis politiques et économiques de l’Égypte constituent une « menace réelle » contre la sécurité du pays, a ajouté le général Abdel Fattah al Sissi, également ministre de la Défense, sur la page Facebook de l’armée. L’armée, qui a assuré l’intérim du pouvoir entre la chute de Hosni Moubarak, en février 2011, et l’élection de Mohamed Morsi, en juin dernier, demeurera « le bloc solide et cohésif » sur lequel « reposent les fondations de l’État », a-t-il poursuivi. Il a prévenu également que la protection du canal de Suez était l’une des priorités du déploiement militaire dans les villes du secteur. Face aux violences meurtrières déclenchées la semaine dernière, le président égyptien a décrété dimanche soir l’état d’urgence dans les villes de Port-Saïd, Suez et Ismaïlia. Mais le couvre-feu n’a pas été respecté, des postes de police ont été attaqués et deux hommes au moins ont été tués dans des affrontements qui se sont produits dans la nuit de lundi à mardi à Port-Saïd, épicentre des violences de ces derniers jours. Cette nouvelle vague d’affrontements a éclaté à la veille du deuxième anniversaire, vendredi, du déclenchement de la révolution qui a emporté Moubarak. Elle a été attisée par la condamnation à mort, samedi, de 21 accusés impliqués dans la tragédie du stade de Port-Saïd où 74 personnes, dont des supporters d’un club de football cairote, avaient trouvé la mort en février de l’année dernière. Au total, le bilan de ces nouvelles violences est d’au moins 52 morts. Lundi, l’opposition a rejeté l’appel au dialogue lancé par Morsi et des foules nombreuses de manifestants ont défilé au Caire, à Alexandrie et à Port-Saïd, Ismaïlia et Suez. « À bas Mohamed Morsi ! À bas l’état d’urgence ! », ont scandé les manifestants à Ismaïlia. À Port-Saïd, des hommes ont attaqué plusieurs postes de police après la tombée de la nuit. De source proche de la sécurité, on indique que des policiers et des soldats ont été blessés. De source médicale, on parle de deux morts et douze blessés lors des affrontements, dont dix par balle. Au Caire, les flammes s’élevant de véhicules incendiés par des manifestants ont éclairé le ciel lundi soir. Mardi matin, des petits groupes constataient les dégâts autour de la place Tahrir, des jeunes se sont hissés sur une camionnette calcinée de la police, mais contrairement aux matins précédents, aucun incident n’était signalé. Les manifestants accusent Mohamed Morsi et les Frères musulmans, dont il est issu, d’avoir trahi les idéaux de la « révolution du Nil ». Les Frères musulmans ont remporté les cinq scrutins organisés depuis la chute de Moubarak (deux référendums, deux élections parlementaires et l’élection présidentielle qui a porté Morsi à la tête de l’État en juin dernier). « La loi martiale, l’état d’urgence et l’arrestation de civils par l’armée ne sont pas une solution à la crise, c’est juste une provocation de plus pour la jeunesse », a déclaré Ahmed Maher, du Mouvement du 6-Avril, en pointe dans le soulèvement de l’hiver 2011. « La solution doit être politique et s’attaquer aux racines du problème », a-t-il ajouté. This entry was posted in L'insurrection égyptienne et ses suites and tagged Abdul-Fattah al-Sisi, Ahmed Maher, Frères musulmans, Hosni Moubarak, Ismaïlia, Le Caire, Michael Hanna, Mohamed Morsi, place Tahrir, Port-Saïd, Suez. Bookmark the permalink.